Spread an eastern Oregon map over the hood of a decades-old pickup truck and point to any spot at random. Tim Lillebo could not only tell you five intimate details about the chosen location, he could recall everything that happened during his last visit there—the bull elk he spotted over the ridge, the Indian paintbrush on the forest floor, the bottle of George Dickel whisky passed around the campfire. "He had an encyclopedic knowledge of the landscape of the area," said Sean Stevens, Oregon Wild's Executive Director. "And he knew how to share it with people." 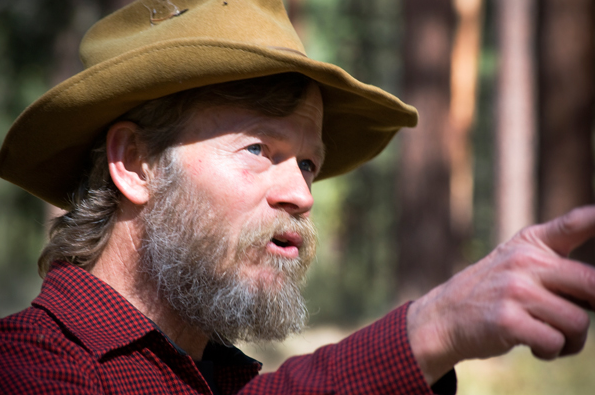 Lillebo, it seems, is remembered as much for his sharing as he is for his fighting—fighting to keep wild places wild, and working to preserve the old growth ponderosas and high desert mesas he knew and loved. Lillebo was instrumental in garnering a number of eastern Oregon wilderness designations over the years, including that of the North Fork John Day, a 91,000-acre parcel in the Blue Mountains of northeastern Oregon. Since the mid '70s he has worked both through grassroots organizations and in Washington, D.C., but perhaps his best work was achieved around a campfire, brokering deals in the desert. It was a great loss on Saturday, Feb. 8 when Lillebo, 61, died while shoveling snow at his Tumalo home. Friends, family and fellow forest advocates gathered at Aspen Hall last Sunday to celebrate his monumental life. "It was tough for many, but the tone was celebratory," Stevens said of the service which included a number of memorable stories about the bearded, grizzled but warm and infinitely friendly mountain man. Lillebo grew up in eastern Oregon and even worked as a timber faller in his youth—an experience that friends said gave him an appreciation for Oregon's storied forests. His job also made him brutally aware how unsustainable the harvest of old growth trees was. In 1975, Lillebo, who was living in Grant County near the community of John Day, helped start the Grant County Conservationists. "One of our first campaigns was to increase the Strawberry Mountain wilderness," remembered Catherine Morrow, one of Lillebo's longtime friends. It was the early '80s and the American West was in the midst of contentious timber wars, which raged in Oregon for nearly two decades. "Because of Tim, I guess we were effective." Self-described back-to-the-land hippies, Morrow and her husband were befriended by Lillebo in Grant County 40 years ago. The wily Lillebo persuaded Morrow and others to do what they could to protect their wooded high desert home from logging: testify at congressional hearings, solicit financial contributions, make T-shirts, draft appeals—whatever it took, they did behind Lillebo's smiling leadership. "There's nobody that had the commitment to Eastern Oregon, the depth of the knowledge and the relationships [that Tim did]," Morrow said. It was that depth of knowledge and deep love for the land that set Lillebo apart. Lillebo, Morrow said, is a man who always took the back roads and always stopped to smell the proverbial flowers. "Tim taught everyone to stick their noses in the furrows of the bark of pine trees and smell them," Morrow said. "He loved beginning and ending each day with a campfire," said Mike Riley, executive director of the Environmental Center. "He just loved that part of being outside—that's one of my strongest memories." Last summer Riley and Lillebo went on a 26-day Alaskan river trip near the Gates of the Arctic National Park and Preserve, another bastion of American wilderness. In fact, this September marks the 50th anniversary of the Wilderness Act, signed into law by President Johnson in 1964. Wilderness is simply and elegantly defined in the act as "an area where the earth and its community of life are untrammeled by man, where man himself is a visitor who does not remain." Currently, only four percent of Oregon land carries a wilderness designation. But, Riley reminded, such protected areas wouldn't exist without advocates like Lillebo, a man who tirelessly worked for the Portland-based conservation group Oregon Wild for nearly 40 years. "Every single wild area has people behind it—people who worked hard to protect that property," Riley said. "Tim is one of those people who worked to do that in our state." As time wore on, Lillebo's position on forest management evolved. Rather than promote an outright ban on logging, Lillebo began to advocate for active forest management through thinning and controlled burns. He was also integral to two ongoing collaborative projects in the area: the Ochoco Forest Restoration Collaborative and the Deschutes Collaborative Forest Project. Both involve varied stakeholders, from conservation reps, to Forest Service officals, to timber businessmen. Phil Chang, the Central Oregon Intergovernmental Council's program administrator, worked with Lillebo on both collaboration projects. And Lillebo made sure all sides knew that selective thinning would be best for the forest's health, best for preventing high severity wildfires and best for the logging companies (if you cut all the trees today, what will you cut tomorrow)? "Tim was able to connect with them," Chang said of Lillebo's ability to bring disparate groups to the table. "There's this misperception that he was a great compromiser," Chang added. "But Tim didn't have to compromise. He proved you can have a win-win-win."